In times of turbulent international relations, policy on its own cannot solve the problem of climate change. Businesses will play an important role in leading the transformation towards a low-carbon world, because they have the capability to develop new solutions. This transition will require strong and courageous leaders who can implement (sometimes costly) changes with benefits that might only be felt in the long term. The task for business school is thus not only to equip students with adequate knowledge but to foster passion, endurance and creative thinking, to enable the new generation to tackle the global climate change problem. Through my role I see that many future business leaders – our current business school and university students – have the ambitious dream of ‘saving the planet’ and are rightly outraged by the issue of climate change. Armed with a basic knowledge, many are intent on becoming the wind of change once they graduate. However, they are often not aware of how complex climate change policy negotiations are and how slow progress can be once they enter the world of work. This can lead to disillusionment long before they can even begin to make the impact they had hoped for. So what can business schools and universities do to prepare their students? CEMS has found an innovative approach. 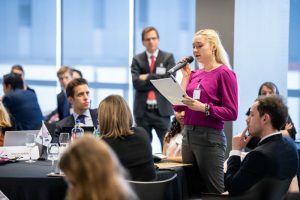 In May this year, 150 Master in Management students from nine CEMS business schools came together in Barcelona for a full-scale simulation of the COP23 climate change negotiations, in which each student played the role of government, non-government or industry representatives from around the world. In preparation for the annual event that took place for the tenth time at rotating locations in Europe a semester-long course about climate change is taught in parallel at all participating universities. The simulation tends to light a fire even in those students who did not share the dream of ’saving the planet’ before. While some of the facts learned during regular business classes will eventually fade, having such an intrinsic motivation is essential when leading a business into a low carbon future. Role play brings realism into the debate about the global climate change problem. In the beginning of the semester, students tend to argue that the Paris Agreement is a failure due its non-binding nature and rather unambitious NDCs. Trying to compose such a climate change agreement themselves, the reality that reaching an agreement at all is extremely challenging, kicks in. They see for themselves that negotiating solutions is a slow process and that it is very difficult to find an agreement when there are so many parties involved, with opposing views and constraints. It is worth the effort – young leaders understand that their ideas and interests are not the only ones and that every country, every individual and every business has different challenges and merits. Only with this kind of realism, will business students be prepared to take on the battle against climate change and make an imprint on whichever industry they eventually move into. Lastly, students learn about integrity – a character trait of utter importance in the business world. In a business environment where managers tend to run from one flight to another, talking about climate change might sound hypocritical. Instead of waiting for a strong leader to pave the way, students need to understand that it is on every one of us to mitigate our impact. 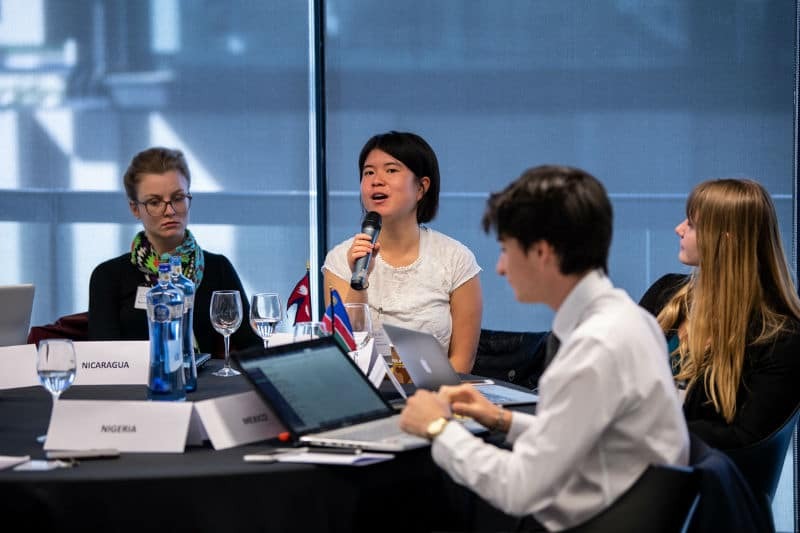 The CEMS Model UNFCCC simulation calls for every participant to mitigate impact on climate, financially supporting train travel to the role play. Something we were all asked to consider was how to stick to a CO2 emissions baseline – during the simulation and after. However, to stick to this baseline, even after moving into a comfortable job, or being entrenched in a complex working environment, requires a strong personality and integrity. Overall, business students need to be aware that the leadership to tackle climate change comes from every single one of us. This is why there is such value in organizing large-scale climate change negotiations, rather than just sticking to a regular university course. Real life simulations are essential if universities and business schools are to better prepare students for the complexity of real-world dynamics and build the leadership skills, as well as the knowledge, to drive a better future for business. Johanna Bocklet is Research Associate at the Chair of Energy Economics, University of Cologne. She teaches on the CEMS programme. CEMS is a global alliance of 31 leading business schools, 72 multinational companies and 7 NGOs that together offer the CEMS MIM.